The wealthy island-state has a near-perfect record of keeping its shores free from terror, but as it prepares to host defence ministers from around Southeast Asia this week, it appears to have good reason to have prioritised stopping the spread of terrorism in the region. Singapore says it has been the target of terror plots for years. Armed officers patrol a train station where television screens and giant posters warn of the threat from terrorists. Nearby, fake gunmen storm a shopping mall in one of many recent terror attack simulations. But this is not some war-ravaged country. It is one of the safest in the world, Singapore. The cosmopolitan financial hub, which was second only to Tokyo in The Economist Intelligence Unit's Safe Cities Index in 2017, says it has been the target of terror plots for years, some stemming from its Muslim-majority neighbours, and that it's a matter of 'when' and not 'if' terrorists will strike. "Singapore continues to face a serious security threat from both homegrown radicalised individuals and foreign terrorists who continue to see Singapore as a prized target," Singapore's Ministry of Home Affairs (MHA) said in response to e-mailed questions from Reuters. Singapore authorities say they have been a target of Islamic extremism since the 1990s, but efforts to deter terrorism have stepped up markedly in recent years with more frequent attacks on Western countries and after ISIS terrorists briefly took over a town in the southern Philippines last year. Raising further concerns about the threat to the island, a Singaporean soldier has featured on a number of ISIS promotional videos, most recently in December where he was filmed executing men alongside other terrorists. In its inaugural Terrorism Threat Assessment Report released last year, the MHA said ISIS has demonstrated that Singapore is "very much on its radar" and that the threat to the country remains "the highest in recent years" - claims that are backed up by security experts. "Singapore, being known as safe and secure, makes it such a risk target," said Dan Bould, Asia director of crisis management at professional services firm Aon and a former captain in the British army. "If there's an attack in the Philippines, it may get half an hour in a 24-hour news cycle. An attack in Singapore with all the multicultural individuals operating here, will be within the narrative for a few days at least." The reality is that Singapore has so far escaped the attacks seen in other major world cities like New York, London and Berlin in recent years. That's why it is at the bottom of the 2017 Global Terror Index, with no reported terror-related attacks post 9/11. 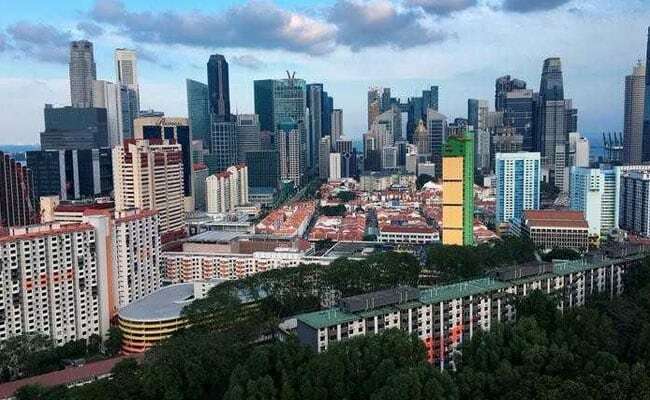 But three in four Singaporeans believe that it's only a matter of time before the country experiences a terror attack, a poll by the local newspaper Sunday Times last year showed. Simulations of terror attacks - including one just over a week ago where masked gunman stormed a children's activity centre on the resort island of Sentosa - are regular. Last month, Singapore's military undertook its biggest mobilisation exercise in more than three decades, including an inter-agency response to the simulation of a gunman at its national stadium. Authorities said last year there was reliable information that ISIS terrorists were considering carrying out an attack in Singapore in the first half of 2016, a threat which they said was countered. In August 2016, neighbouring Indonesia, which has the world's largest Muslim population, arrested six suspects with links to ISIS who were accused of plotting rocket attacks on Singapore's iconic Marina Bay Sands hotel. Malaysia, Singapore's northern neighbour which also has a Muslim-majority, and Indonesia say thousands of their citizens sympathise with ISIS and hundreds are believed to have travelled to Syria to join the group. Regional security officials say many are returning home after reverses in the Middle East. The most controversial measure at its disposal is its colonial-era Internal Security Act which allows for suspects to be held for lengthy periods without trial. The MHA said it currently has 20 people detained under the Act for "terrorism-related" activities, and since 2002 has held close to 90 for such activities. "ISA is a fantastic deterrent, and so far it has worked," Singh said.